With the new version of Dynamics 365 Portals, it is now possible to enable General Data Protection Regulations (GDPR) in portals. Check for the below content snippets. If its already there, don’t create. Duplicate records may lead to improper functioning. This is the header of your terms and conditions page. 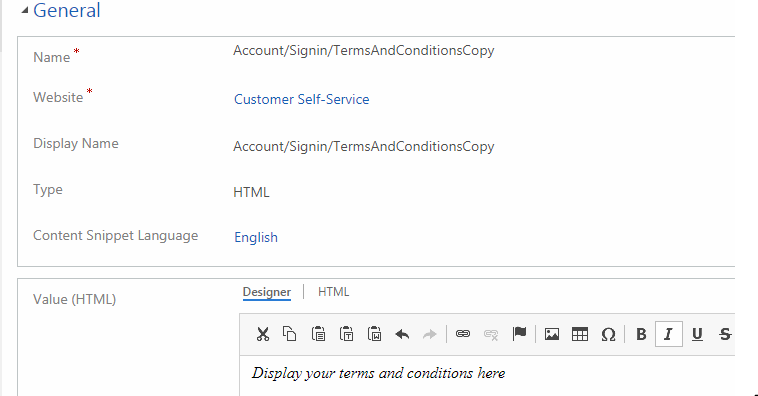 I Set the value – “Custom Terms and Conditions”. This is the body of your terms and conditions and you can place your HTML stuff in here. This is the text which is usually displayed beside the checkbox in the terms and condition page, usually at the bottom of the page. The text of the button in the terms and conditions page. Now we are done with four basic settings. However just putting in these settings won’t enable the terms and conditions for your portal. There is another site setting that you need to create if not already created. Authentication/Registration/TermsAgreementEnabled. It is a Boolean flag which indicates whether terms and conditions are enabled for your portal. Set it a value of true. There is another site setting that you need to lookout for. Authentication/Registration/TermsPublicationDate. It’s a date value which determines from which date is the terms and conditions applicable. If any user who has logged in to the portal and he/ she has not accepted the terms and conditions after the date specified, the user would be asked to Agree the moment they sign in. 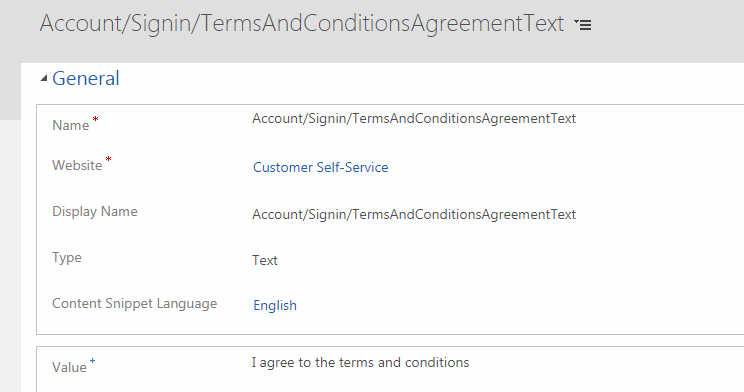 To identify when a contact has accepted the terms and conditions, there is a field in contact which captures this value. It’s called Portal Terms Agreement Date. Hope this helps! Happy CRMing. Hi there, Does all these setting work for you when enabled for ESS portal? as these are not working as expected. Do I need to put these content snippet in any of the page template. wondering how these content snippet will be rendered on portal? Appreciate your response. Thanks! Hi Shweta, Not sure about ESS portal but it should work I guess. I can spin up a trial of ESS and check and let you know. The snippets mentioned and the site settings mentioned here are kind of pre-determined and the framework checks for these snippets to show GDPR. I’ve followed the instrustions above and they work a treat, however I keep getting prompted for the terms every time I sign into the proral. Any ideas? Thanks for reading my blog. 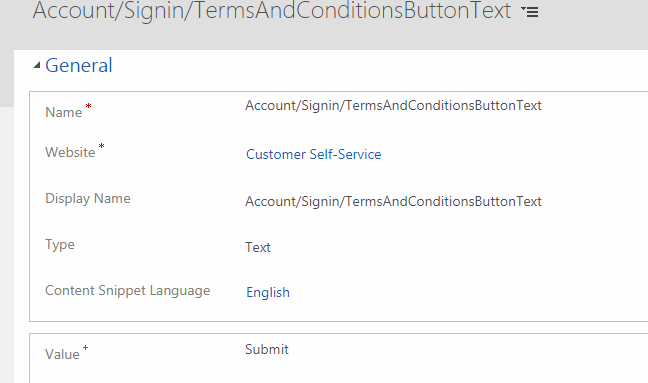 Could you check whether Portal Terms Agreement date of the contact is getting populated?